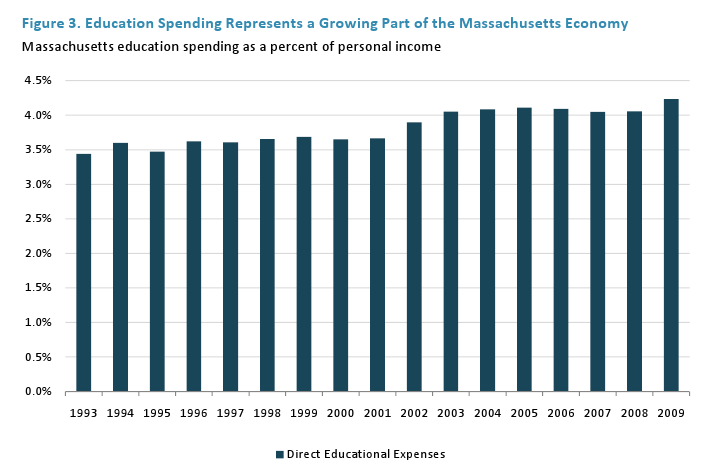 Recently released Fiscal Year (FY) 2009 education spending data from the US Census Bureau provide important information on long-term spending trends in Massachusetts and help paint a picture of the state's commitment to elementary and secondary public education. 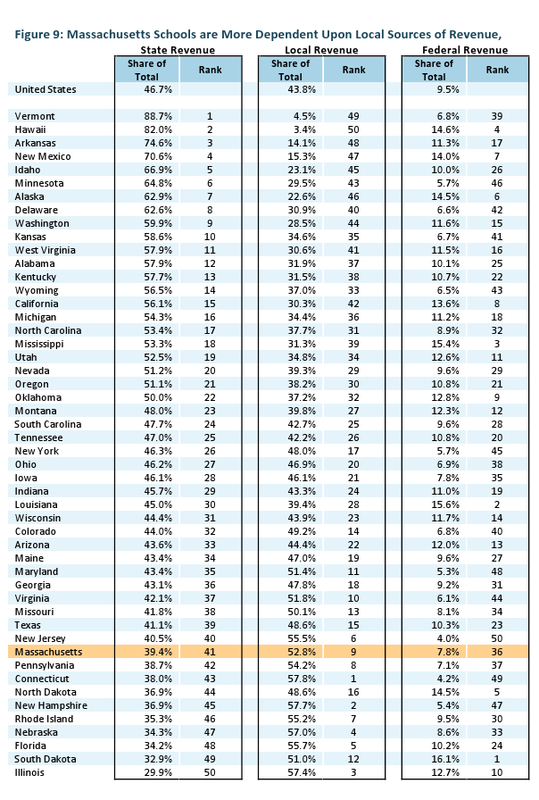 This Census data also allows for instructive comparisons between Massachusetts's support for public education and that of other states. The FY 2009 data release represents the first year in which we observe the increasing dependence of states on federal education revenue, as state and local budget cuts precipitated by the onset of the Great Recession coincided with a large infusion of federal stimulus funds. The federal government responded to the fiscal crisis in states by distributing additional federal education funding through the State Fiscal Stabilization Fund (SFSF), a subset of the larger national stimulus bill, the American Recovery and Reinvestment Act (ARRA). States distributed the education portion of their SFSF allocation to K-12 school districts during FY 2009, FY 2010, and FY 2011. Massachusetts saw a significant increase in federal education revenue in FY 2009 as a part of federal stimulus efforts to protect local schools from being harmed by cuts in state aid. Massachusetts ranks high in per-pupil spending but average in total education spending as a percentage of the state economy. As an affluent state, Massachusetts has a greater capacity to invest in education than lower-income states. The state's high per pupil ranking reflects these greater resources, even when correcting for higher costs. 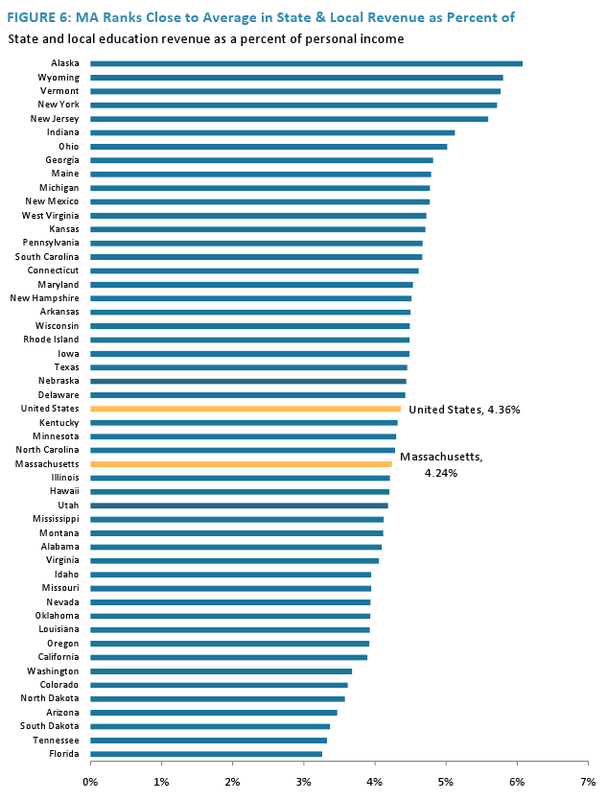 (Massachusetts also ranks high on educational outcomes as reflected in National Assessment of Educational Progress (NAEP) standardized test scores, often leading the nation.) However, when viewed as a share of the state's economy Massachusetts ranks right near the national average. Massachusetts essentially mirrors the national average in education spending as a percentage of the total economy. Massachusetts has historically ranked lower on this measure but jumped in this year's rankings because in FY 2009 the state used a greater proportion of its three-year federal stimulus funds than did most other states. Massachusetts schools continue to rely heavily on local funding sources, in particular. What are the sources of funding? The relative proportions of state, local, and federal funding sources vary over time and across states, and this section analyzes some trends. 1 For more information on the use of personal income to gauge economic growth please see: New England Public Policy Center of the Federal Reserve Bank of Boston, "Assessing Alternative Measures of State Income," July 30, 2008, available at: http://www.bos.frb.org/economic/neppc/memos/2008/weinerpopov073008.pdf. Massachusetts continues to rank high in terms of both nominal per-pupil spending, ranking 7th in the nation, and cost-adjusted spending, ranking 10th (Figure 1). Because costs and wages vary widely across different parts of the country, it is important to adjust for these differences in order to make a fair comparison. 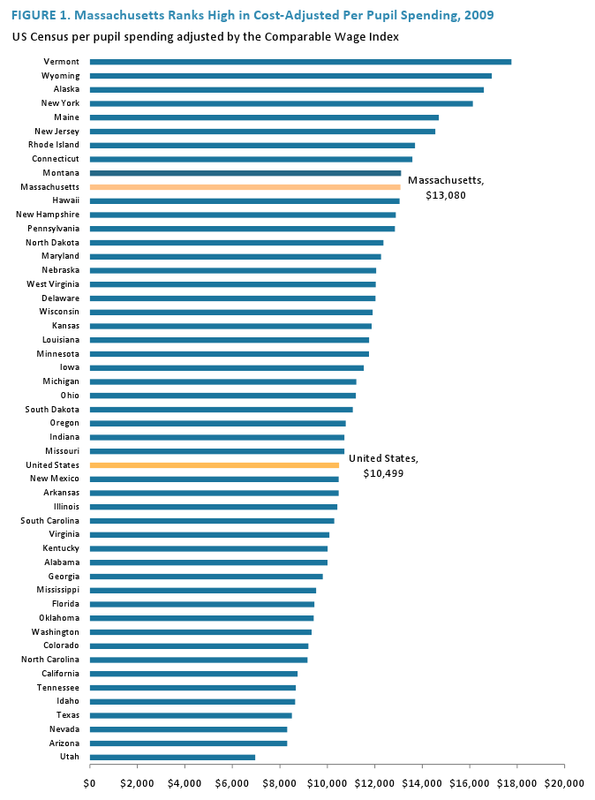 This paper accounts for these differences by adjusting US Census per pupil expenditure amounts using the Comparable Wage Index, a geographic measure of wage levels used to facilitate comparisons across states.2 The state's cost-adjusted per-pupil spending level of $13,080 exceeds the national average by $2,581, or roughly 25 percent. It is important to note that the Census's per pupil measure includes only direct educational expensesincluding things like employee salaries and benefits, administration, and materialsand does not include capital spending and debt service. Per pupil measures that include capital spending can be useful in capturing the full costs of running school systems, but they can lead to great variation over time and across states. Capital spending is lumpy year-to-year because large payments happen over different years, depending on when large investments are being made, and this can lead to volatile per pupil spending amounts that do not necessarily affect students and teachers at the classroom level. Additionally, states report capital spending in different ways and the Census Bureau has a difficult time gathering 50-state data that allows for meaningful comparisons. Massachusetts's results on the NAEP suggest that the state is getting strong results for its high per-pupil investment. Figure 2 shows a snapshot of these scores for eighth grade math and reading between 1992 and 2009, a time frame during which the state increased its commitment to helping fund K-12 education. To see how Massachusetts compares to other states for different demographic subgroups at different grade levels and subject areas please click here. 2 For more information on the Comparable Wage Index see: http://nces.ed.gov/pubsearch/pubsinfo.asp?pubid=2006865. WHAT IS K-12 PUBLIC EDUCATION'S SHARE OF THE TOTAL ECONOMY? Direct elementary and secondary education spending comprises a much larger share of the state's economy than it did in the early-1990s (Figure 3)3. This paper uses FY 1993 as a baseline for analyzing education spending because it allows one to track the effects of Massachusetts's Education Reform Law that began to be implemented in FY 1994 and took several years to phase in. In the 1992-1993 school year, education spending comprised 3.44 percent of the state's economy, compared to 4.23 percent in the 2008-2009 school year--23 percent growth. When looked at as a share of the economy, education spending remained roughly stagnant from FY 2003 to FY 2008, whereas it increased somewhat for FY 2009. Adjusted for inflation, personal income declined from FY 2008 to FY 2009, as the Great Recession began. At the same time, federal stimulus revenue enabled the state to avoid deep cuts to previously budgeted education spending levels. This slight decline in the value of personal income combined with moderate education spending increases led to an increase in education spending as a percent of the economy for FY 2009. During more typical economic times, growth in the economy roughly offsets normal cost growth in state programs like education. While lagging behind in previous years, education spending in Massachusetts as a share of the state's economy essentially mirrored the national average in FY 2009 (Figure 4). 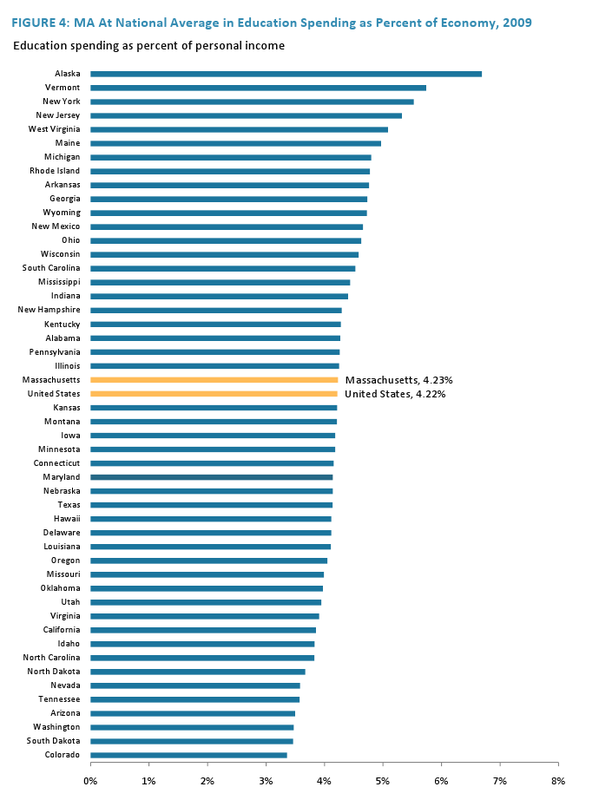 Massachusetts ranked 23rd on spending as a percentage of the state economy in FY 2009, compared with 30th in FY 2008. Massachusetts chose to use more of its federal SFSF money during the first of three available years, FY 2009, than did most other states, leading to this increase in the rankings. Massachusetts has also grown very close to the national average when looking only at state and local education spending as a share of the economy, setting aside federal money. As Figures 5 and 6 demonstrate, state and local education spending in Massachusetts comprises 4.24 percent of personal income in FY 2009, compared to the national average of 4.36 percent. During FY 2005 and FY 2006, state and local spending in Massachusetts actually surpassed the national average.4 Massachusetts ranks higher in FY 2009 comparisons that include federal revenue and spending because the state used a greater proportion of its three-year federal stimulus funds in FY 2009 than did most other states. It is important to note that the measure of education spending as a percent of the state economy, shown in Figure 4, looks at direct elementary and secondary education spending from all state, local, and federal sources; this measure does not include spending on capital projects or other community programming or adult basic education classes. The measure of state and local revenue as a percent of the state economy shown in Figure 6, on the other hand, includes education revenue regardless of what it is spent on, including capital spending and other community activities. 3 "Direct educational expenses" are based upon the US Census Bureau's category of "current spending," which includes expenses such as: salaries, benefits, professional and technical services, and supplies. 4 Please note that the percentages in Figures 5 and 6 are higher than percentages in Figure 4 because Figures 5 and 6 use state and local revenue, which include revenues spent on capital projects. Total expenditures included in Figure 4, by contrast, do not include capital spending due to major undercounting of Massachusetts's capital spending in the US Census Bureau data set. For almost two decades, except for a slight decrease in fiscal years 2003 through 2005, state and local governments have together funded roughly 95 percent of school budgets in Massachusetts.5 Shown below, Figure 7 demonstrates that the federal government historically plays a relatively small role in education funding in Massachusetts, although this has changed during the current fiscal crisis as reflected in the stacked bars for FY 2009. Public schools in the United States have historically been dependent on local property taxes, particularly in New England. 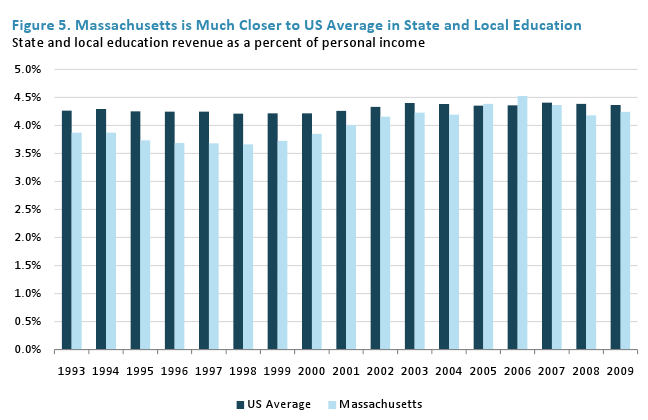 The Education Reform Law of 1993 served to reduce somewhat this reliance in Massachusetts, ushering in a series of significant state funding increases during the remainder of the 1990s. 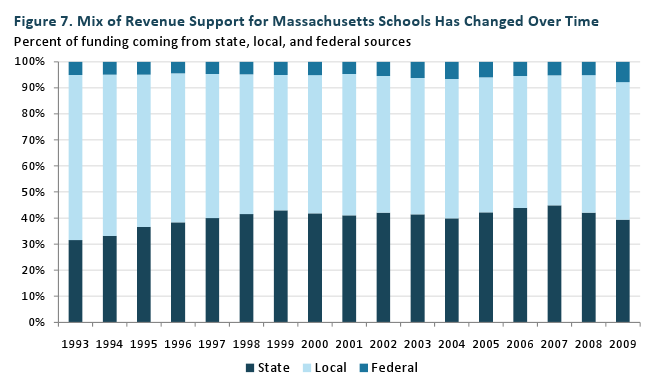 While Massachusetts has shifted some of the education funding responsibility away from local sources, however, Massachusetts is still heavily reliant on local revenues when compared to other states. In FY 2009, Massachusetts was ninth most dependent upon local funding. Part of why Massachusetts ranks low when considering its federal share of education funding is that Massachusetts is a relatively wealthy state. Because of its greater property and income wealth Massachusetts has a greater ability to dedicate state and local resources towards education. Additionally, a significant portion of federal education revenue, such as Title I funding, is distributed proportionally to the number of low-income students in a school, so Massachusetts receives less of this funding than many other states with greater shares of low-income students. Federal funding for education in Massachusetts remained relatively flat from FY 1993 to FY 2008, ranging from 4.5 percent to 6.5 percent. 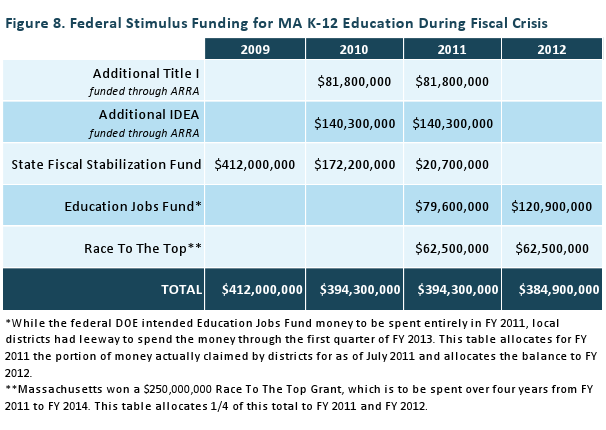 The federal share of education funding increased significantly to 7.8% in FY 2009, the combined result of new federal stimulus funding and mid-year state budget cuts. FY 2009 is the first year in which Census data reflect increased federal education revenue distributed to states and local school districts through the American Recovery and Reinvestment Act (ARRA). For three years starting in FY 2009, ARRA funds increased federal education support in a few different ways, including through the State Fiscal Stabilization Fund (SFSF), increased Title I and Individuals with Disabilities Education Act (IDEA) funding, the Education Jobs Fund, and the Race To The Top competitive grant program. Figure 8 outlines these sources of funding during the four fiscal years affected by ongoing the fiscal crisis. Where Massachusetts's rank changed the most from FY 2008 to FY 2009 is in its share of federal revenue, moving up from 48th in FY 2008 to 36th in FY 2009. States were given significant leeway in spending their federal SFSF allocation across FY 2009, FY 2010, and FY 2011. In part because the stimulus package was passed in February of 2009, well into the second half of fiscal year 2009, Massachusetts was one of the few states that chose to spend much of it during FY 2009, leading to this observed jump when comparing Massachusetts to other states. While we do not yet have 50-state data on spending in FY 2010 and FY 2011, we expect that Massachusetts's ranking on federal revenue as a share of total revenue did come back down for these years as other states spent a greater proportion of their SFSF funding later in the three-year stimulus cycle. 5 Education spending data in FY 1997 contains an error in state spending information and so the chart above uses an average of FY 1996 and FY 1998 data to approximate FY 1997.